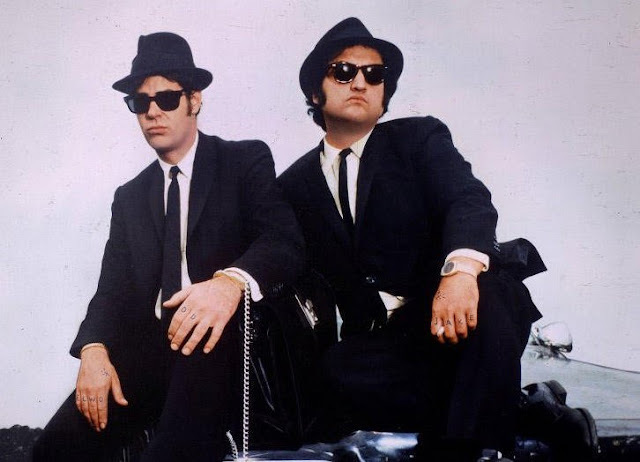 July 22, 1979 –Joliet Jake and Silent Elwood Blues, the Blues Brothers, are in Chicago to begin filming the movie that will make them international stars. “Hundreds of onlookers hung over guard rails as the bluesmen’s ancient black-and-white squad car screamed south on Lake Shore Drive,” reports the Chicago Tribune. “Twenty-seven pairs of newer squads, their lights flashing, followed at close range. An unmarked helicopter hovered above.” [Chicago Tribune, July 23, 1979]The squad cars are rented from the Chicago Police Department and driven by off-duty officers hired by the film crew. One off-duty cop says, “I feel good that they’ve chosen to shoot it in Chicago. We have a beautiful city, and it hasn’t had its fair share of movies.”. Residents in high-rise buildings along Lake Shore Drive flood the newsroom of the Tribune with calls, thinking that a high-speed pursuit of a criminal is taking place. The film looked as though it were doomed to failure when it opened on June 20, 1980 since it was released in less than half the theaters than a typical big film of that era would have received play. In the first week the $27.5 million film brought in $4,858,152, second only to The Empire Strikes Back. Ultimately, The Blues Brothers, brought in $115,229,890 in foreign and domestic markets. 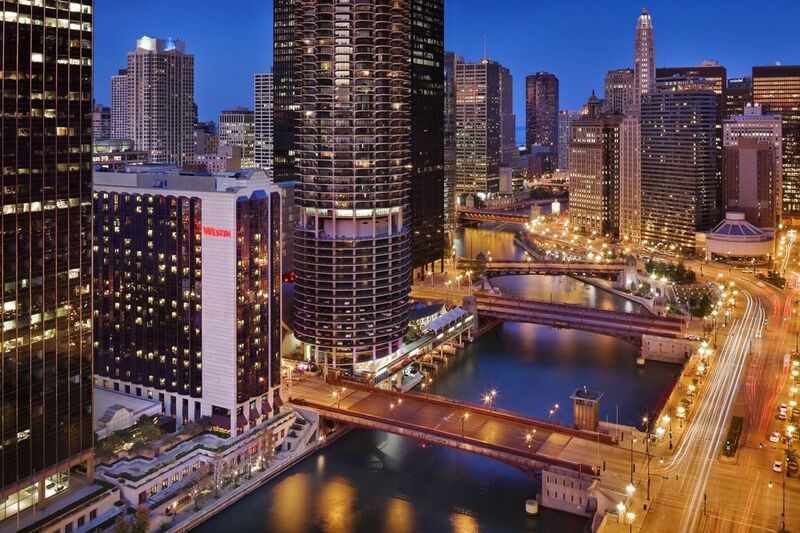 July 22, 1985 -- TIshman Realty and Construction Company, Incorporated and Japan Air Lines Development announce plans to build a 450-room luxury hotel on the north side of the Chicago River. Scheduled to open in June of 1987 on the northwest corner of Dearborn Street and the river, the hotel is expected to cost $70 million. The firms of Hellmuth, Obata and Kassabaum, Inc. and Takyama and Associates, Inc. project a 350,000 square foot hotel with a 100-seat gourmet French restaurant, a 150-seat Japanese restaurant, and two lounges totaling 160 seats. The hotel will also feature a 9,000 square-foot ballroom and a smaller 4,000 square-foot gathering hall. The announcement of the new hotel follows the start of the 35-story Quaker Tower in the same area, a tower that will house the new headquarters for Quaker Oats Company, scheduled to move from the Merchandise Mart in early 1987. In January of 1997 the Hotel Nikko became the Westin River North Chicago and away went Benkay, the Hotel Nikko's Japanese-style restaurant. July 22, 1897: The formal ceremonies dedicating the Logan Monument in Grant Park are held, beginning a 1 p.m. After the two-hour dedication ceremony, guns sound on the shore and from ships on the lake, and a parade of 10,000 marchers begins at Twelfth Street and Michigan Avenue and moves north on Randolph, west to State, south to Adams, west to Dearborn, north to Washington, west to LaSalle, south to Jackson, finally ending at Michigan Avenue. Mrs. Logan, the general’s widow, is received that evening at the Coliseum with a fireworks display and band concert preceding that event. 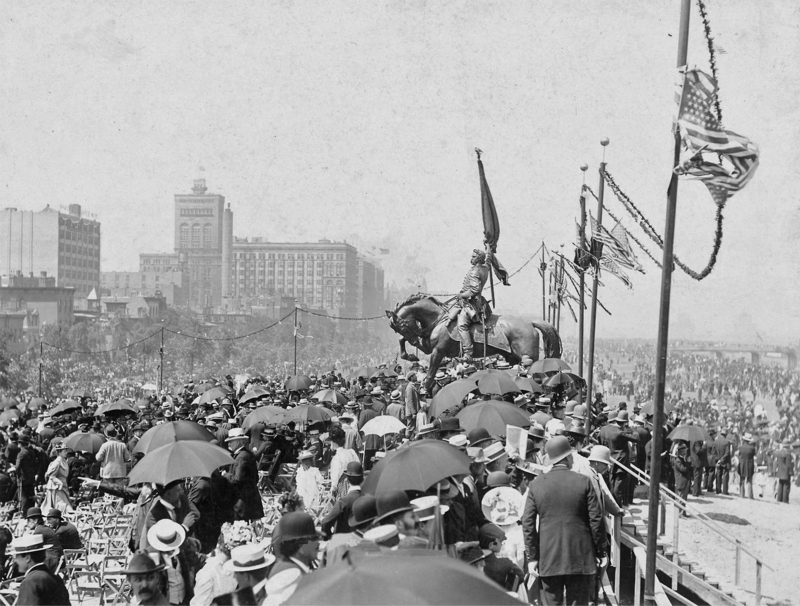 Of Augustus St. Gaudens’ equestrian statue of General Logan, the Chicago Daily Tribune writes, “In the statue of General Logan St. Gaudens has chosen as the dominant idea the expression of courage, the martial courage, which is born of patriotism and indomitable will.” The above photo shows the dedication ceremony on that July day in 1897.